Manipur’s guest list for the recently concluded commemoration included dignitaries from countries which took part in the battle. Dr Slim is one of the many international dignitaries visiting Manipur to mark the 70th anniversary of the Battle of Imphal. 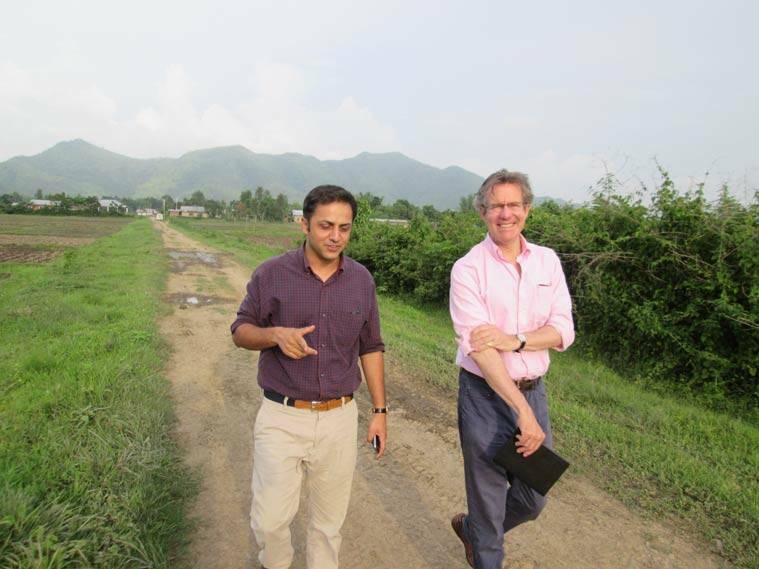 It was an emotional visit to Manipur for Dr Hugo Slim. It was where his grandfather and father fought in the British Army. It was where his grandfather, Field Marshal Viscount William Slim, popularly known by his soldiers as “Uncle Bill”, was first defeated by the Japanese in Burma. And it was where General Slim regrouped, restrategised and eventually defeated the Japanese in what is now considered the greatest battle ever fought by the British Army and the most crushing land defeat the ‘invincible’ Imperial Japanese Army ever suffered. “I came first in 1998 – my father asked me to bring him on this pilgrimage. He was 70 years old at the time, I was 36. It was really moving for me to see the veterans travel long distances to see the graves of their loved ones. Some sat by the graves, others bought little gifts. There was an 82-year-old woman from East End London who never left the country before – the first plane she had ever taken landed straight in Kolkata. Her fiancé had died in the Battle, she never married. It wasn’t like visiting Normandy or other places in Europe or even Africa. Manipur was barely known at the time, it was hardly a famous place, and it was very far,’’said Dr Slim. Dr Slim is one of the many international dignitaries visiting Manipur to mark the 70th anniversary of the Battle of Imphal. It was victory in this battle that led Lord Mountbatten to confer Field Marshal Slim the honour of being “the finest general World War II produced.” He led the 14th Army, known as the Forgotten Army, as the soldiers felt they had been forgotten by their countrymen in this far-flung corner of the world even as the allies were poised to crush Nazi Germany. Manipur’s guest list for the recently concluded commemoration included dignitaries from countries which took part in the battle – the British deputy high commissioner Scott Furssedonn Wood, Military advisor British High Commission Lt Col Simon Colyer, the Australian deputy high commissioner Philip, First Secretary (Defence) Australian High Commission Jane Spicer, Consul General Consulate of United States Helen LaFave, Military Attaché US Embassy Col Larry J Redmon and Charge de Affaire Deputy Chief of Mission Y Kawamura. “Manipur at a crossing point. It is where the two empires clashed in competition, and then the British retreated Westward and the Japanese Eastward. Then came a frozen period when Burma became a hermit state and the conflict in Manipur and Nagaland staved off visitors. The world came to Manipur during the Battle, and now it is coming back again. People want to construct roads, start buses between the countries, planes. It’s like the Russian Glasnost, where Manipur is finally opening up to the rest of the country and the world,’’ said Dr Slim. This visit has been a dramatically different one from his earlier, says Dr Slim. “At the time I was ignorant – I knew this was where the battle had been fought and that it was next to the Burmnese border, but didn’t understand the north east, didn’t know that it was a separate part of the country, not a part of the country quite in the same way as other parts were. That it would be so much more like Burma than the rest of India. The battle was therefore forgotten in India as well. I didn’t know Manipur or Nagaland at all at the time. We visited the British and Indian war cemeteries and lunched and dined with the Assam Rifles but that was it. It was a small town with one hotel and not a famous place at all,’’said Dr Slim. Unlike the last time, Dr Slim has taken battlefield tours across Manipur to understand his grandfather’s war. “I am so grateful for what battlefield guide Hemant Katoch and his tours have done – it’s a pioneering effort in India, and he has done 60 tours already. It’s because of him that I’ve been able to see the battlefields first hand, something my father has been unable to do – this is so important to the families of the war veterans and those who fell,’’says Dr Slim who over a period of three days drove down the Tiddim Road, climbed up Nungshigum, walked across the Shenam Saddle and even paid tribute at the Japanese war memorial at the base of the Red Hill where over 300 Japanese soldiers were killed. “This is the first time I have been to a Japanese war memorial. It’s still difficult for the older generation of war veterans to attempt a reconciliation with the Japanese, and I would not have done it myself before on principle. The places I had only read before in my grandfathers book – ‘Defeat into Victory’, I have now seen and walked. I have understood how the fighting unfolded,’’adds Dr Slim who also represents the Burma Star Association – an associations of British war veterans who fought in Burma. “I was also very struck by Kangla Fort – it was a revelation to me this time. I understood Manipur’s history for the first time,’’he added. 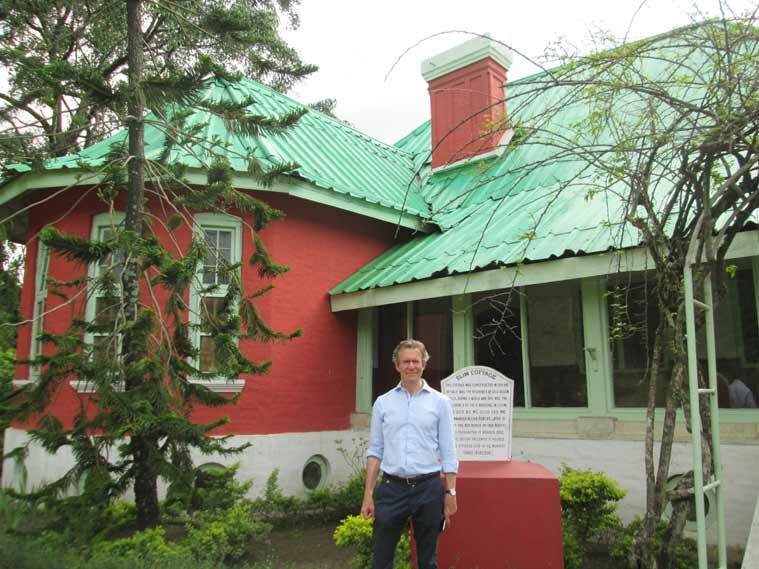 It’s with the walls of the Kangla Fort, in one corner, that Field marshal William Slim’s cottage still stands. There is talk afoot to now convert this colonial cottage into a war museum. Former Governor Manipur VK Duggal had taken up the matter with Chief Minister Okram Ibobi Singh last year. He had directed that a high powered committee be set up to carry out various projects related to the world war. “The idea is that Slim Cottage should house war memorabilia not just from Britain but from all the countries that were involved in the battle. All the countries have agreed in principle as have the Japanese who have said they are more than happy to help out. I have spoken to Dr Slim about it and his family will be more than willing to assist,’’Governor Duggal had told The Indian Express. “This is the right time for the museum. It must be a museum of the whole battle – of all the countries involved and must take place in an integrated manner and of international standard. What we can do is go home and raise funds and ask the government here to match it. War tourism is huge in the rest of the world, especially in Europe. And now Manipur is on the brink of it as well,’’added Dr Slim. Meanwhile, Duggal had proposed that Manipur begin its preparation for the 75th anniversary of the Battle of Imphal. “Being a commemoration is not enough. This needs to be turned into an economic opportunity for Manipur. The Airport ugradation will be complete by then and flights to Myanmar would have begun. More hotels would have come up and train connections would be in place. I have proposed that the Ministry of Home Affairs, the MEA, DONER, Tourism Ministry and the Defence Ministry also be roped in and involved in this,’’said Duggal.